Edmund's dev blog for gay nerds: Super Meat Boy Wii! Are you a fan of small cubes of animated meat? Do you enjoy the sound of buzz saws? When you hear the term "wall jump" do you get excited? Well, what if you woke up to find you were made of a lump of juicy raw meat, your girlfriend was made of band-aids and to top it all off she had been kidnapped by a fetus in a jar wearing a suit and monocle? Would that be totally awesome? or just kinda awesome? Well I'm hoping you chose totally awesome, because that's basically the premise of Super Meat Boy. In Super Meat Boy you take the role of a small animated cube of meat on his quest to save his lady love Band-Aid girl from the clutches of the evil Dr. Fetus! Sliding his way through saw mills, salt factories and even hell itself, Meat boy jumps into action in this fast paced and extremely challenging platformer that will "melt your face off". 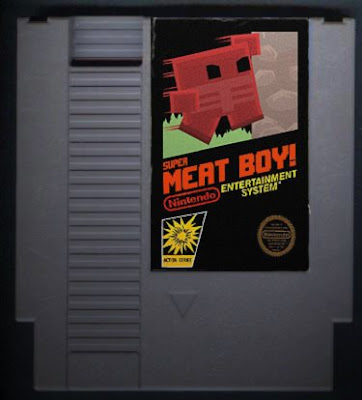 Super Meat Boy will be completely remade from the ground up for its release on Wiiware™ and will feature over 100+ single player levels, insane boss fights, competitive vs modes, beefy co-op play and a slew of unlockables that are rumored to fill your life with great happiness! SMB (best abbreviation ever) is being designed by Gish co-creator Edmund McMillen, Tommy Refenes and "Big" Jon McEntee. We will be documenting Meat Boy's rebirth for Wiiware on our development blog via Supermeatboy.com so feel free to pop in and tell us all your lame ideas we will never use! Thanks for the support! and keep indie gaming alive! Nintendo trademarks used under license. WiiWare is available only through the Wii console. Tommy and I will be updating the SMB dev blog weekly, most of the info wont be posted here so if your interested feel free to subscribe to it as well. So at this point my work load is obviously packed, i have 2 more flash games planned for release in the next month, but after those it will only be SMB, No Quarter and (secret unannounced console title) till the end of the year. Wish me luck! and spread the word! It seems that above differences are easy to be encountered. But actually, they are too trivial to find out. As the technology in modern society has been greatly improved, to distinguish the real replica watches and its replica becomes more and more difficult. Suppose you are about to buy a 100% authentic one, I suggest you to go to the authentic store. Though it may be a little more expensive than that selling in the website, you at least have no scare about its quality. Or perhaps you can go to the discount stores for money saving. Panerai watches , son of an Italian trader founded the Patek Philippe watches in 1906. This is a good blog message, I will keep the post in my mind. hahaha excellent, nice game very entertaiment, surely is because i'm in the office, good luck I'll put your link on my facebook. This was a funny post! This is a fantastic, what a post i like it very much lots of thanks for your post.